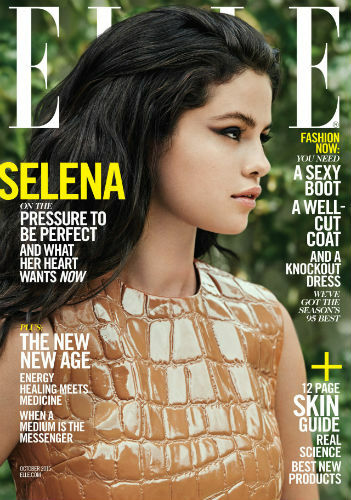 -I love the styling of Selena Gomez’s new Elle cover, but the interview preview is a little eye-rolly. Authentic is not exactly the first word that springs to mind when I think of her. -It’s good to see that Liam Hemsworth is having fun with all the free swag that gets sent to his hotel room during the fest. -Considering all the amazing restaurants on King Street, there is no excuse why Kristen Stewart and Nicolas Hoult ended up eating at Hooters following their TIFF premiere. Like, none. -Where Johnny Depp and Amber Heard go, drama follows. Even in Toronto. -I went to the Spotlight premiere last night and also noticed that Rachel McAdams was strangely quiet. I just assumed it was because the real reporters the movie is based on took part in the Q&A and she wanted to give them the spotlight (no pun intended). -Spotlight was one of my favourite TIFF films so far (Brooklyn is the other), but it’s a strange year where there seems to be no critical consensus or breakout hit. It’ll make for wide open Oscar race. -Every time I get the urge to watch Empire and see what all the fuss is about, I’m going to read this article about Terrence Howard‘s special brand of crazy to remind myself why I shouldn’t. -“Peak TV” is a phrase critics have been throwing around all summer. Here’s a good primer on it. -The X Files reboot now has an air date: Jan 24, 2016. Chris Carter also explained why Mulder and Scully are the way they are at the beginning of the show. Basically, it’s because it’d be easier to write, which…meh. –Julia Roberts wished she’d washed her hair before Taylor Swift surprised her by pulling her onstage during a concert. -Everyone talks a lot about the drawbacks of outrage culture so it’s nice to hear Sarah Silverman’s counter argument about comics who don’t want to play college campuses anymore. –Jimmy Fallon and Justin Timberlake take their bromance to another level with wordless conversations. -Things looking up for Ben Affleck, according to People magazine. Does that mean a reconciliation is in progress — or is that just what his camp wants us to think? -This is a really good analysis of Matt Damon‘s diversity comments. Start at this tweet and read her whole thread below. -Speaking of diversity, I really like Salon’s piece about representation on TV. This is especially relevant today, as CBS chief Nina Tassler just stepped down and she was the only woman running a network solo. -Journalists should probably stop asking famous peeps about their sexuality because they’re having none of it. See: Tom Hardy and Demi Lovato. –Ariana Grande was on GMA this morning to promote her new perfume and had to talk about the donut incident. At least she had the decency to put her (pony)tail between her legs and seem ashamed. –Chloe Grace Moretz takes on aliens in The 5th Wave trailer. I read this book last summer when I was going through a YA binge. It’s solid. -Wow, the first trailer for Disney’s live-action version of The Jungle Book is insanely good.